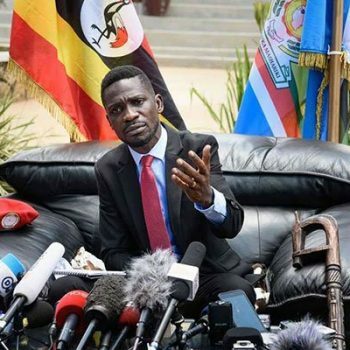 Bobi Wine Charged Up To End Museveni’s Three Decades Rule. I have seen a few comments on social media seemingly wondering how our call on the people to register as voters will rid Uganda of dictator Yoweri Kaguta Museveni. Some have raised doubts that an election, organised by Museveni’s controlled Electoral Commission can rid our nation of Museveni and Musevenism. Indeed, there are some comrades who have suggested that we should forget about 2021 and kick Museveni out of power before the end of 2019- Algeria or Sudan style. To begin with, we are not naïve. We are fully cognizant that Museveni has rigged the past elections with impunity. There is no doubt whatsoever that similar attempts will be made during the next election. Only a few days ago, Kahinda Otafiire [Justice and Constitutional Affairs Minister] expressed clear lack of commitment on the part of government to implement electoral reforms as recommended by the Supreme Court after the 2016 election[s]. We are even aware of plans by Museveni and his regime to amend laws so as to block our participation in the next election.